Compared to mechanical hard drives, SSDs continue to be a disruptive technology. These days it’s difficult to convince folks to spend more money, but I can’t stress the difference in user experience between a mechanical HDD and a good SSD. In every major article I’ve written about SSDs I’ve provided at least one benchmark that sums up exactly why you’d want an SSD over even a RAID array of HDDs. Today’s article is no different. The Fresh Test, as I like to call it, involves booting up your PC and timing how long it takes to run a handful of applications. I always mix up the applications and this time I’m actually going with a lighter lineup: World of Warcraft, Adobe Photoshop CS4 and Firefox 3.5.1. Other than those three applications, the system was a clean install - I didn’t even have any anti-virus running. This is easily the best case scenario for a hard drive and on the world’s fastest desktop hard drive, a Western Digital VelociRaptor, the whole process took 31 seconds. And on Intel’s X25-M SSD? Just 6.6 seconds. A difference of 24 seconds hardly seems like much, until you actually think about it in terms of PC response time. We expect our computers to react immediately to input; even waiting 6.6 seconds is an eternity. Waiting 31 seconds is agony in the PC world. Worst of all? This is on a Core i7 system. To have the world’s fastest CPU and to have to wait half a minute for a couple of apps to launch is just wrong. I’m writing this page of the article on the 15-inch MacBook Pro I reviewed a couple of months ago. I’ve kept the machine stock but I’ve used it quite a bit since that review thanks to its awesome battery life. Of course, by “stock” I mean that I have yet to install an SSD. Using the notebook is honestly disappointing. I always think something is wrong with the machine when I go to fire up Adium, Safari, Mail and Pages all at the same time to get to work. The applications take what feels like an eternity to start. While they are all launching the individual apps are generally unresponsive, even if they’ve loaded completely and I’m waiting on others. It’s just an overall miserable experience by comparison. It’s shocking to think that until last year, this is how all of my computer usage transpired. Everything took ages to launch and become useful, particularly the first time you boot up your PC. It was that more than anything else that drove me to put my PCs to sleep rather than shut them down. It was also the pain of starting applications from scratch and OS X’s ability to get in/out of sleep quickly that made me happier using OS X than XP and later Vista. It’s particularly interesting when you think of the ramifications of this. It’s the poor random read/write performance of the hard disk that makes some aspects of PC usage so painful. It’s the multi-minute boot times that make users more frustrated with their PCs. While the hard disk helped the PC succeed, it’s the very device that’s killing the PC in today’s instant-on, consumer electronics driven world. I challenge OEMs to stop viewing SSDs as a luxury item and to bite the bullet. Absorb the cost, work with Intel and Indilinx vendors to lower prices, offer bundles, do whatever it takes but get these drives into your systems. I don’t know how else to say this: it’s an order of magnitude faster than a hard drive. It’s the difference between a hang glider and the space shuttle; both will fly, it’s just that one takes you to space. And I don’t care that you can buy a super fast or high flying hang glider either. just to add to the chorus of praise: this is a superbly informative article, thank you for all the effort, and I hope that it has paid off for you, as I'm sure it must have. My first question is this. Is it possible to analyse a program while you're using it, to see whether it is primarily doing sequential or random writes? Since there seems to be a quite clear difference between the Intel X25m 80gb and the OCZ vertex 120gb, which are the natural entry-level drives here, where the Intel works better for random access, the vertex for sequential, it would be very useful to know which I would make best use of. Second question: does anyone know whether lightroom in particular is based around random or sequential writes? I know that a LR catalog is always radically fragmented, which suggests presumably that it is based around random writes, but that's just an uninformed guess. It does have a cache function, which produces files in the region of 3-5mb in size--are they likely to be sequential? 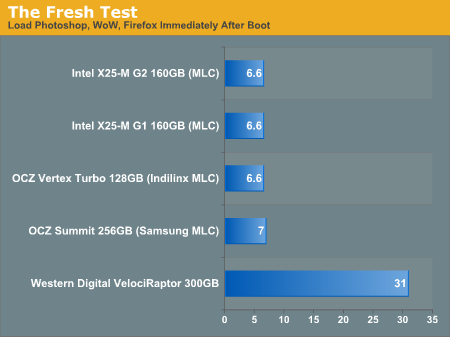 Third question: with photoshop, is it specifically as a scratch disk that the intel x25m underperforms? Or does photoshop do other sequential writes, besides those to the scratch disk? I ask because if it only doesn't work as a scratch disk, then that's not a big problem--anyone using this in a PC is likely to have a decent regular HDD for data anyway, so the scratch disk can just be sent there. In fact, I've been using a vertex 120gb, with a samsung spinpoint f3 500gb on my PC, and I found that with the scratch disk on the samsung I got better retouch artists results (only by about half a second, but that's out of 14 seconds, so still fairly significant). Thanks in advance to anyone who might be able to answer, and thanks again Anand for such an informative read. just to report back, since writing the previous comment I have bought both drives, vertex and intel (the original vertex 128gb, and the intel g2 x25m). While the Intel does perform better in benchmarks, the difference in general usage is barely noticeable. Except when using lightroom 3, when the intel is considerably slower than the vertex. I'm using a canon 550d, which produces 18mpx pictures. When viewing a catalogue for the first time (without any pre-created previews), the intel takes on average about 20s to produce a full scale 1:1 preview. This is infuriating. The vertex takes about 8s. Bear in mind that i've got 4gb of 1333mhz ram, intel i7 q720 processor, ati 5470 mobility radeon graphics. So it's not the most powerful laptop in the world, but it's no slouch either. I can only conclude that when LR3 makes previews it does large sequential writes, and that the considerable performance advantage of the vertex on this metric alone suddenly becomes very important. With which in mind, I'm now going to sell the Intel and buy a vertex 2e, which will give the best of both worlds. But I'm sure there are lots of photographers out there wondering about this like I was, so hopefully this will help. I believe you are correct about the LR Catalog being mostly random writes, but I don't think this is a performance concern since the Catalog is likely stored in RAM for reads, and written back to the drive when changes are made that affect the Catalog, which is not happening all the time. As for the generating previews and Photoshop scratch disk, this is going to be primarily sequential since it is generating the data one at a time and writing it to disk completely. If LR was generating multiple previews for multiple photos simultaneously and writing them simultaneously, then you would have heavy fragmentation of the cache, and more random writes. Any SSD is going to give significant performance benefit over spindle HD when it comes to random read/write/access. Sequential performance is the man concern with Photos/Video/Audio and similar data in most cases. After spending all weekend reading this article, 2 previous in the trilogy, and all the comments, I wanted to post my thanks for all of your hard work. I've been ignoring SSDs for a while as I wanted to see them mature first. I am in the market for a new Alienware desktop, but as the wife is letting me purchase only on our Dell charge account, I have a limited selection and budget. I was settled on everything except the disks. They are offering the Samsung 256SSD, which I believe is the Samsung PM800 drive. The cost is exactly double that of the WD VelociRaptor 300 GB. So naturally I have done a ton of research for this final choice. After exploring your results here, and reading comments, I am definitely not getting their Samsung SSD. I would love to grab an Intel G2 or OCZ Indilinx, but that means real cash now, and we simply can't do that yet. The charge account gives us room to pay it off at 12-month no-interest. So at this point I can get a 2x WD VR in raid 0 to hold me over for a year or so when I can replace (or add) a good SSD. My problem is that I have seen my share issues with raid 0 on an ICH controller on two different Dell machines (boot issues, unsure of performance gain). In fact, using the same drives/machine, I saw better random read performance (512K) on a single drive than the ICH raid, and 4k wasn't far behind. I'm thinking I may stick to a single WD VR for now, but I really want to believe raid0 would be better. So, back on topic, it would be nice to see the ICH raid controller explored a bit, and maybe add a raid0 WD VR configuration to your next round of tests. Thumbs up for the ICH10 petition. It's the most common RAID controller on i7. Also, I would like to see different models of SSD in RAID (For example one intel raided with one Indilinx). "Is Intel still my overall recommendation? Of course. The random write performance is simply too good to give up and it's only in very specific cases that the 80MB/s sequential write speed hurts you." am 23 years old computer engineer..
Should I put the windows page file (swap) to the SSD disk or to another normal HD? Generally the swap should be behind other controller than your OS disk, to speed things up. However, SSD disks are so fast that there is a temptation to put the swap on OS disk. Also, one consideration is the disk age, does it preserve it longer if swap is moved away from SSD. * Drive indexing disabled. (useless for SSD anyway, because access times are so low). Any comments and/or suggestions for windows 7 on that?